I was watching an episode of The Kitchen and saw Marcella making this apple pie recipe. About 10 seconds into her making the recipe, I grabbed my phone, opened up my Amazon app and found a set of cookie cutters like the ones she was using. With those ordered, I just needed to purchase the rest of the ingredients and make this as soon as possible. Unfortunately it took a few weeks before I was able to make it, but it was more than worth the wait. 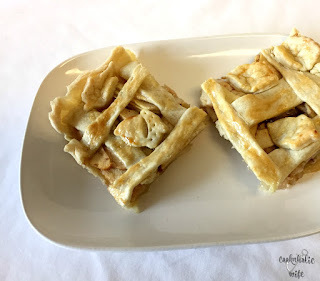 I love the idea of making the pie on a sheet pan because you don’t have to worry as much about piles and piles of apples and their juices weighing down on a crust in such a small area. Here the apples are spread out thinner over a large area, which also helps for the crust to get crustier, which in my opinion, is even better. 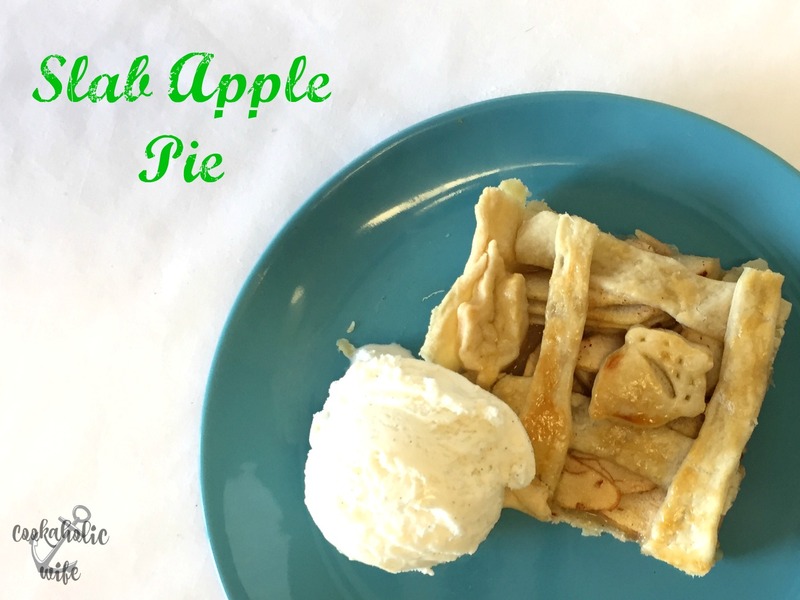 This apple pie recipe definitely feed a crowd! I plan on making it again for Thanksgiving! When you need apple pie for a crowd, make this slab version baked on a jelly roll pan to feed the masses. 1. In a large bowl, combine 4 cups of flour, 1 teaspoon of sugar and the pinch of salt. Use a pastry blender to cut in the butter until the mixture feels like coarse crumbs. 2. Add one tablespoon of water at a time to moisten it, and mix, repeating until a dough starts to form. 3. Knead the dough into a ball, then divide in half, flatten each half into a rectangle and wrap in plastic wrap. Refrigerate for at least 2 hours. 4. Combine the apples in a large bowl with cinnamon, remaining ⅓ cup of flour, and ½ cup of sugar. Toss until the apples are coated and allow to sit until the apples release their excess juices. 5. Preheat the oven to 350 degrees. Spray a half sheet pan (15 x 10 x 1) with non-stick cooking spray. 6. Lightly flour a work surface and roll one piece of the dough into a 19×13 rectangle. Place the dough onto the prepared pan and gently press it up the sides, being careful not to make the dough too thin in the center. Trim any excess dough and set aside. Crimp the edges or press down to smoothen. 7. Remove the apples from the bowl with a slotted spoon, allowing any excess juices to drain back into the bowl. 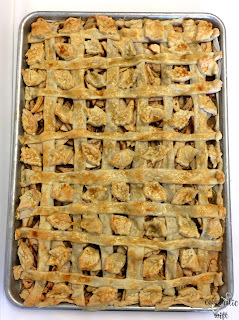 Spread the apples over the dough in an even layer. 9. Arrange the dough leaves or strips over the apples, leaving areas where the apples are still visible so the steam can escape while cooking. 10. Brush the whisked egg over the leaves and edges of the dough. 11. 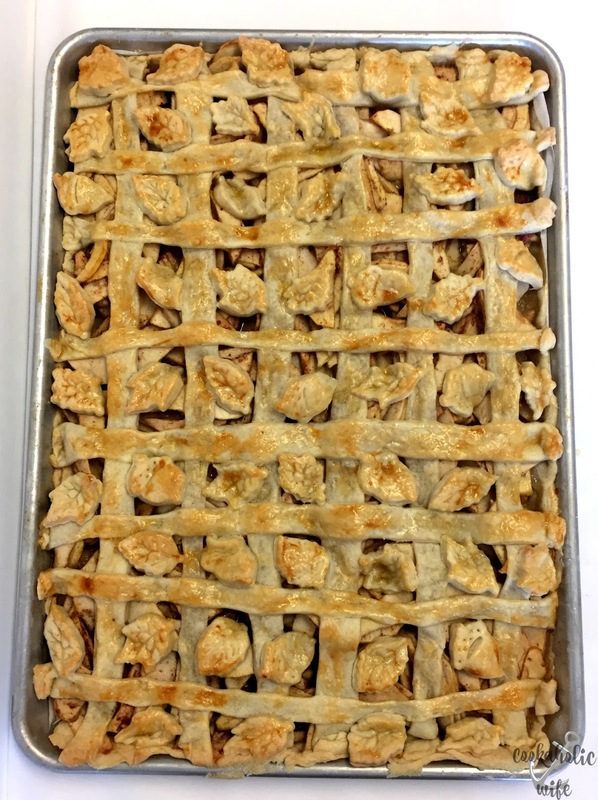 Bake for 40-45 minutes or until the apples are fork tender and the dough is golden brown. Cut into squares and serve, optionally topped with vanilla ice cream. The dough needs to be refrigerated for at least 2 hours. Now, I will admit, this pie takes some time to put together. The dough needs to be refrigerated, but then rolled out pretty thin to cover the entire jelly roll pan and then cutting out the top with those small cookie cutters takes forever, which is why I opted to do a combination of the lattice top with the leaves and acorn cookie cutters.